The RP Photonics Buyer's Guide contains 10 suppliers for excimer lasers. An excimer laser is a powerful kind of laser which is nearly always operated in the ultraviolet (UV) spectral region (→ ultraviolet lasers) and generates nanosecond pulses. The excimer gain medium is a gas mixture, typically containing a noble gas (rare gas) (e.g. argon, krypton, or xenon) and a halogen (e.g. fluorine or chlorine, e.g. as HCl), apart from helium and/or neon as buffer gas. An excimer gain medium is pumped with short (nanosecond) current pulses in a high-voltage electric discharge (or sometimes with an electron beam), which create so-called excimers (excited dimers) – molecules which represent a bound state of their constituents only in the excited electronic state, but not in the electronic ground state. (More precisely, a dimer is a molecule consisting of two equal atoms, but the term excimer is normally understood to include asymmetric molecules such as XeCl as well. The term rare gas halide lasers would actually be more appropriate, and the term exciplex laser is sometimes used.) After stimulated or spontaneous emission, the excimer rapidly dissociates, so that reabsorption of the generated radiation is avoided. This makes it possible to achieve a fairly high gain even for a moderate concentration of excimers. As excimer lasers use molecules as the gain medium, they can also be called molecular lasers. For various of those wavelengths, specialized excimer optics (ultraviolet optics) have been developed, which need to have a high optical quality and in particular a very high resistance to the intense ultraviolet light. 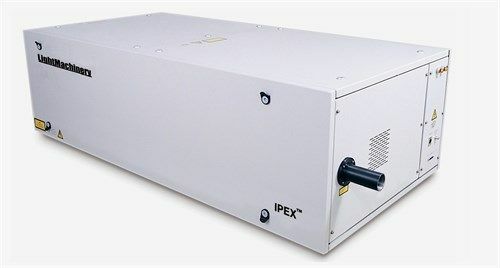 Typical excimer lasers emit pulses with a repetition rate up to a few kilohertz and average output powers between a few watts and hundreds of watts, which makes them the most powerful laser sources in the ultraviolet region, particularly for wavelengths below 300 nm. The wall-plug efficiency varies between 0.2% and 2%. Early excimer lasers had limited lifetimes due to a variety of problems, arising e.g. from the corrosive nature of the gases used and from contamination of the gas with chemical byproducts and dust created by the electric discharge. Other challenges are the ablation of material from the electrodes and the high peak power of the required current pulses, which often allowed the thyratron switches to last only for a couple of weeks or months. However, a lot of engineering, involving e.g. the use of corrosion-resistant materials, advanced gas recirculating and purification systems, and solid-state high-voltage switches, has mitigated challenges of the excimer laser concept to a significant extent. The lifetime of modern excimer lasers is now limited by that of the ultraviolet optics, which have to withstand high fluxes of short-wavelength radiation, to something of the order of a few billion pulses. Photolithography in semiconductor device manufacturing is an application of major importance. Here, photoresists on processed semiconductor wafers are irradiated with high-power ultraviolet light through structured photomasks. High-power UV light, as can be generated with excimer lasers, is essential for obtaining short processing times and correspondingly high throughput, while the short wavelengths allow one to fabricate very fine structures (with optimized techniques even far below the optical wavelength). However, the latest developments in lithography require even shorter wavelengths in the extreme ultraviolet (EUV), e.g. at 13.5 nm, which can no longer be produced with excimer lasers. Certain laser-generated plasma sources are developed as the successors for excimer lasers in that area. Still, it is to be expected that excimer lasers will be used for fabricating many semiconductor chips for a long time to come, as only the most advanced computer chips require still finer structures than possible with such techniques. Note that excimer lasers raise a variety of safety issues, related to the use of high voltages, the handling of poisonous gases (halogens), and the risk of causing skin cancer and eye damage by irradiation with ultraviolet light.